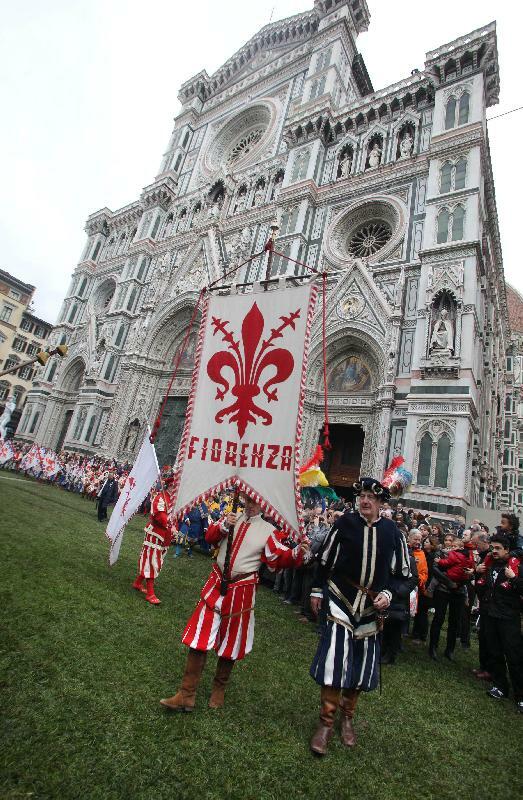 Last Saturday, Florence woke up to behold an extraordinary spectacle at Piazza del Duomo. Here, a magnificent carpet of lush, fragrant green grass was sprawled on top of the dark cold stone ground, transforming the piazza overnight from a bustling urban observation deck into a lush green oasis. This one-day event was organized to commemorate the 4th Century Miracle of San Zenobi, kicking-off the first "International Week on Cultural Heritage and Landscape" hosted in Florence. Walking on the grass-swept meadowland bedecking the piazza was a rare opportunity to feel and smell the soft earthy grass beneath my feet instead of the usual hard musty stone. The whole city lingered, appreciating a fleeting moment in time that would last for only hours. Children played, elders were pushed in their wheelchairs, people strolled and laughed. Mayor Renzi was there hanging with the people, and a historical flag-throwing event followed. 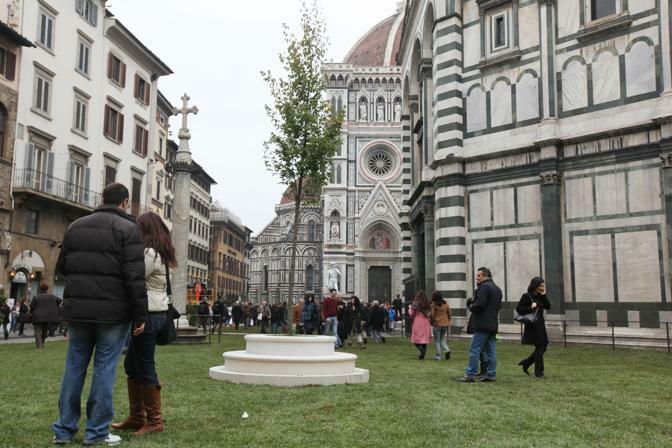 The piazza's transformation transformed the very mood of Florence. Every Florentine walked proud today. This spectacle was just one of 100+ cultural exhibitions, concerts, lectures, films, tours, workshops, wine and gastronomic events that occurred here this past week in various venues all over Florence. The program was packed with events, rendering the city a global forum of art and culture, promoting “international economic and social development through appreciation of our artistic and cultural heritage”. During the week-long conference, a new copy of Michelangelo’s David was exhibited in various spots in Florence, including the duomo, a photo of which I captured in the evening. You can faintly detect the new moon rising by the side of the Duomo. This manifestation recalled the 1504 debate among Florentines as to where the David should be placed. Three copies later the debate still goes on, with Rome being the latest to argue its rights to possess this majestic Florentine icon. I spent much of the week following the activities through its museums, bookstores, libraries and piazzas. I particularly enjoyed a special tour of the Palazzo Strozzi Sacrati, one of the lesser-known treasures of Florence as well as seeing the replica of Loggia dei Lanzi being constructed in Palazzo Vecchio. After living in Florence for 2 years, I fall more and more in love with this city every single day.